Themed Together #WePlayStrong, The European Football Association UEFA launched a comprehensive initiative aimed at inspiring girls between the ages of 13 and 17 to engage in Europe's most popular sport. The purpose of the site is to show that football is a pretty cool sport for girls, too. The site encourages football teams to create „Sticker Snaps“ and share on social with the #WePlayStrong hashtag. A selection of the best images and videos from Instagram and Twitter are included in the Your Story section of the site: impressive videos of girls kickin' it, selfies of proud girls on the field, and testimonials by famous female footballers and musicians supporting the campaign. What's obvious, these girls don't just enjoy playing football, they also love contributing to the community. What's special about this campaign: The campaign is a truly international initiative, giving testament to EU sports commissary Tibor Navracsics's conviction: "Football is so much more than just a game. It builds community and connects people across nations, religions and gender barriers." The campaign site is available in six languages, and using Flockler-powered social wall to highlight the content from all over the world. 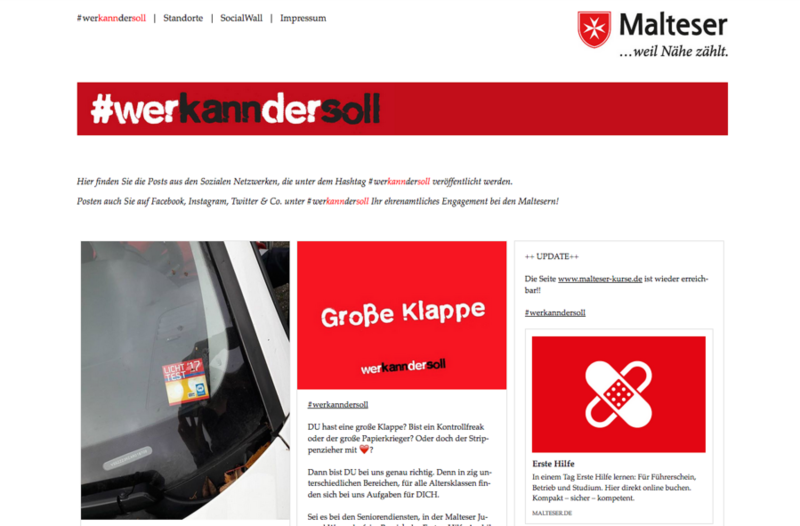 Malteser Hilfsdienst is one of the biggest charities in Germany, providing social services as well as medical aid and education across the country. Their logo, a red crest with a white Maltese cross, is well known to many and a reminder of the organisation's affiliations with the Catholic church. What is less known, however, is that volunteers provide many of the services. Active volunteers are using the hashtag #werkanndersoll on Instagram and Twitter to share their activities, from organizing blood donation drives to teaching first-aid classes. The campaign theme #werkanndersoll means 'those who are able should participate', a reference to the moral obligation to use one's power for the good of the community. Activities posted on social media are collated and displayed on the social media wall. The purpose of the campaign is to build visibility and reach for the organisation's services and to help recruit new volunteers. It also strengthens the community spirit of the volunteers working in different locations across the region. What's special about this campaign: Volunteering is built on committed, active individuals who are willing and able to pass on the community spirit and inspire others to become engaged, as well. Planning to engage your audience in creating content? Don't waste your time searching the web. 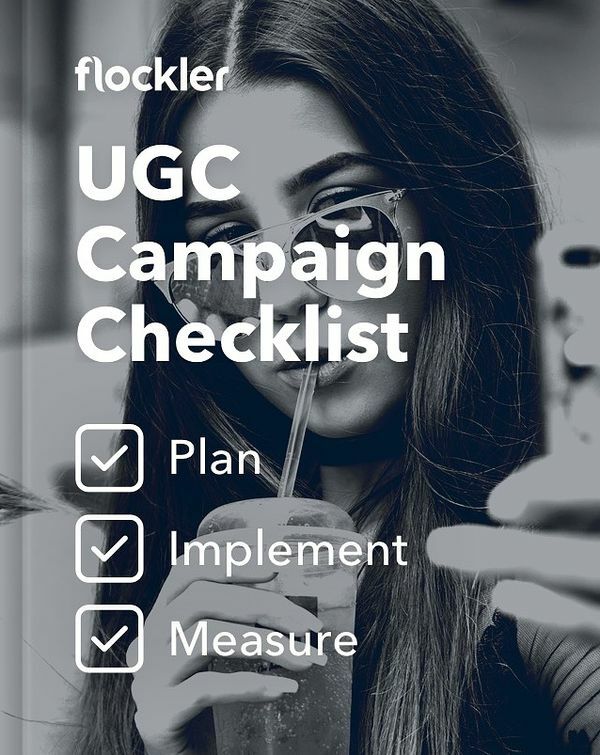 Download our three-step checklist guiding you through planning, implementing and measuring your UGC campaigns! Emmental Valley in Switzerland is not just famous for its cheese, but also for its idyllic landscapes. 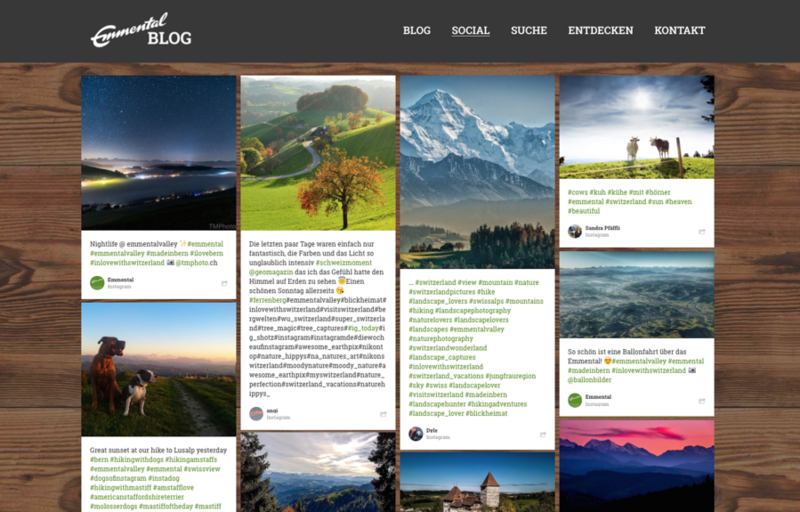 With their Emmental Blog, the local tourism association is taking a fresh approach to content marketing. Besides offering a host of editorial articles on local craftsmen, tour recommendations, and current events, they ask their visitors to post images of the region on social media using the #emmentalvalley hashtag. The most beautiful images are selected and displayed on the blog, making it a creative and colourful social-powered digital magazine. The site features breathtaking views of landscapes, cows, castles, and sunsets. Most of the images are posted by local businesses, Swiss photographers, and mountain enthusiasts, as well as local sports stars and other tourists. What's special about this initiative? Emmental Blog offers a simple and informal way for hotel owners, craftsmen, and local businesspeople from the region to help promote the Emmental brand, easily integrating friends and visitors who love and enjoy the beauty of the region. 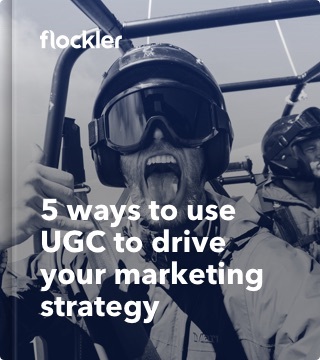 If you are planning to create a successful user-generated content campaign, don't waste your time searching the web. The best way to do marketing in 2018 and increase your reach on social channels? Build engaged communities and use your customers as brand ambassadors. 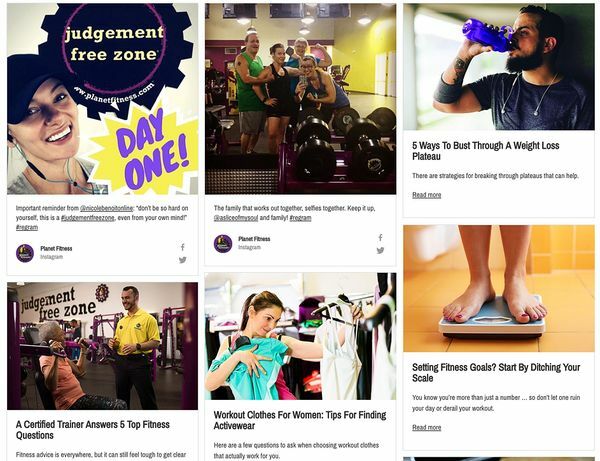 Read how Planet Fitness is getting it right!